Welcome to CatholicMom.com’s Small Success Thursday! This is our chance to look at the things going right this week, no matter how small they seem. Every success is still a success! 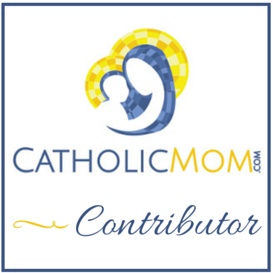 Be sure to check out the other posts at CatholicMom.com today. I haven’t blogged a lot since the beginning of May, but I think that’s going to change. I have already done a couple of articles at CatholicMom.com in the last couple of weeks, and I wrote about manners (or the lack thereof) here at Domestic Vocation. It’s my intent to be consistent. I have things to say, I just need to set the time aside to say them! On that front (and this is slightly old news), I purchased my domain name and it is now working so you end up here when you type it in. DomesticVocation.com is an actual thing! I haven’t done full-on hosting yet, so all that happens when you type it in is that you’re routed here — but that’s a start! I have been running again. I know, I’ve always run a bit, but I got out of the habit of consistent running when we moved the clocks back in the fall of 2014, and I”be never completely recovered the form I had back then. (Or the body, to be frank!) I started using MyFitnessPal to track my food and exercise, and I’ve lost roughly 10 pounds since mid-March. I’ve learned that losing weight at 46 is much different than losing it at 33. Slower, harder, and less forward progress without big steps backward. But, as I said, I’ve started running again. I decided to re-do Couch to 5K, the app that started all of my running. I’m beating my distances from 2 years ago (and, interestingly enough, I started it two years to the day from when I started it the first time), which is nice. Okay, it’s more than nice; I’m really pumped about that. I also decided to do something I’ve never done before: a month-long run streak. I’ve run every day this month so far, and tonight I’ll be back to our weekly pub run at the local brewery. (Seriously, there are two pub runs every week, and the one tonight offers you a free beer every third time you run.) I came close to running every day in July 2014, when I was wrapping up Couch to 5K the first time. But even if all I do on one day is run a mile on the treadmill at the Y, I want to run every. single. day in June. I’m doing my usual post-run selfies on Instagram (Christine_CatholicMomVA) and have started using Snapchat (CatholicMomVA), as well. The other big thing I’m doing lately is letting my daughters go gradually. My older daughter spent a few hours with her friend yesterday, just hanging out and getting ice cream and walking at the local park. My younger daughter left with my parents on Tuesday morning to go on vacation with them and her younger cousins. That vacation starts on Saturday, so her time with Grandma and Pa Pa turned out to be nearly 2 weeks. That was a long time, but then one of her best friends said that she was going to be in Florida for a week, starting the day we were supposed to go to Florida to get my daughter! They asked if they could steal her for the week and return her to Virginia. Now, we had been having trouble coordinating how to get our girl back because her sister couldn’t take Father’s Day weekend off from work. She also doens’t have a license, so she couldn’t just stay home alone (which also may or may not be legal to do in Virginia, anyway). And I felt badly asking my parents to drive back to Virginia again, though they were willing to do so. With this arrangement, I could drive a little more than an hour to Rocky Mount, VA, and meet my friends (her friend’s mom and dad) to get her on the 26th. One final return to my running successes! After that winter when I couldn’t run much, I stopped feeling happy to run. My body liked being inactive, and I would run because I ought to, not because I was enjoying it any more. But on Tuesday, something amazing happened! I was playing Zombies, RUN! and I was running past the library at the bottom of our hill, on the way out at the beginning of my run. I waved at the sheriff who was supervising the inmates doing lawn work, waved at one inmate on the mower, and turned the corner to get onto the sidewalk that goes into town. As I hit the corner, “Whe Streets Have No Name” started up, and I felt something I hadn’t felt (except for when I did the Time Travel 5K last November). I felt joy as I was running! I felt happy to be out, happy to be running, happy to be playing my Zombies, RUN! game. I think this run streak will be good for me, if only to help me feel joy when I run again. What are your successes this week? Tell me about them in the comments or leave your link at CatholicMom.com’s post this week! Wow, Good luck with the Running. And hang in there with the kids gone. It is hard but I enjoyed watching mine spread their wings. My 16 Yo is going to Australia (!) for 10 days next month. AUSTRIA?!?!? I would die. Maybe literally. You are very grave to let your babies go like that. I think it will be good for all of you! I pray so. It is awesome that you are running. Awesome!